Sets There are 10 products. 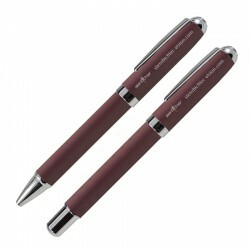 This customized pen set includes a ballpoint pen and mechanical pencil in a glamorous and graceful pearl satin-plated finish. 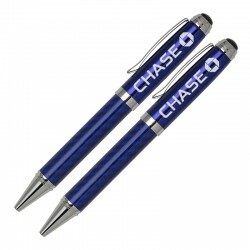 This personalized pen set includes a deep blue executive ballpoint pen and mechanical pencil, both with carbon fiber barrels. This high-end promotional pen set includes a premium carbon fiber ballpoint pen and carbon fiber Rollerball pen in bold red, blue, or green. This customized, carbon fiber writing set features an executive Rollerball pen and mechanical pencil in elegant black. This personalized pen set features a solid brass constructed ballpoint and Rollerball pen, each with a brushed chrome finish. 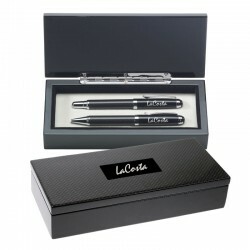 This sleek and stylish pen set includes a ballpoint and Rollerball pen, both with an elegant charcoal satin-plated finish. 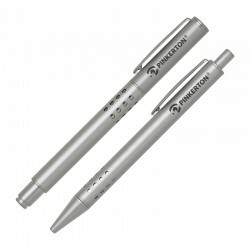 This high-end promotional pen set includes a premium carbon fiber ballpoint pen and carbon fiber Rollerball pen in black or silver. This personalized pen set includes a sleek, black executive ballpoint pen and mechanical pencil, both with carbon fiber barrels. 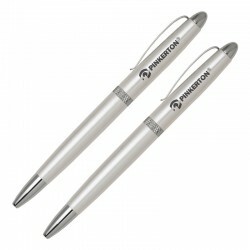 This personalized pen set includes a ballpoint and Rollerball pen, and is available in multiple bright colors.